1. Tony Gwynn won eight National League batting titles in his 20-year career. In those 12 seasons where he did not win a batting crown, in how many of those seasons did Gwynn finish in the Top 5 in N.L. batting? 2. Gwynn was drafted in the third round of the 1981 baseball amateur draft. He was also drafted in the 10th round of the 1981 NBA draft. What NBA team drafted Gwynn in 1981? 3. 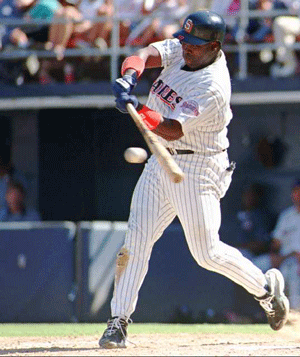 Gwynn collected 3,141 hits in his career. He had 30 or more hits against five different pitchers in his career. Two of those five pitchers were voted into the Baseball Hall of Fame. Name the two pitchers voted into the Baseball Hall of Fame that Gwynn had 30 or more hits against in his career. 1. Gwynn won eight batting titles and finished in the Top 5 in five other seasons. He was the batting crown runner-up in 1993, finished third in the batting title twice (1986 and 1991), was fourth in 1985, and finished fifth in the N.L. batting race in 1992. 2. Tony was drafted in the 10th round of the 1981 NBA draft by the San Diego Clippers. 3. Of Gwynn’s 3,141 career hits, he had 39 hits versus Greg Maddux, 33 against Rick Mahler, 32 against John Smoltz, 31 against Tom Browning, and 30 against Tom Glavine. Maddux and Glavine were both voted into the Baseball Hall of Fame in 2014 and will be inducted in a ceremony this summer.